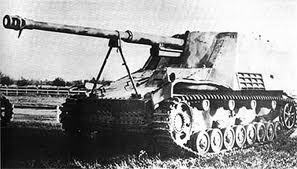 The Nashorn is a German tier 6 tank destroyer. 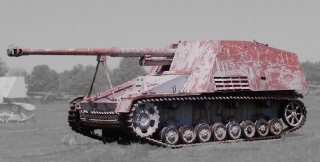 The official designation of the Nashorn ("Rhinoceros") tank destroyer was 8.8 cm PaK 43/1 auf Geschützwagen III/IV (Sf). The vehicle was designated the Hornisse ("Hornet") until 1944. Produced on the same chassis as the Hummel heavy SPG. The vehicle first saw combat on the Eastern Front in the summer of 1943. A total of 494 vehicles were manufactured. 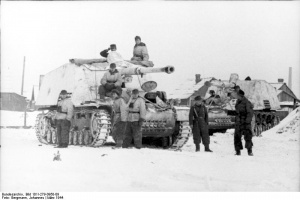 The Nashorn is very similar to its predecessor, the Pz.Sfl. IVc. It sacrificed mobility for a fantastic top gun, however the armor is still negligible and is a relatively large target. Therefore, it should be played in the same fashion as the Pz.Sfl. IVc -- stay behind the frontline in a sniping position and support teammates with its superb penetration and accuracy. In the end game, its increased hit points compared to its predecessor can be very useful. 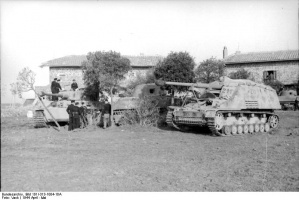 The Nashorn leads to the Sturer Emil. Excellent top gun; possesses overkill penetration yet damage-per-minute and handling are still top notch. This tank plays very much like a true sniper. Possessing a great gun and weak armour. If you reliably take out tanks that your allies have spotted, you will do well. The gun is accurate at 0.32 (8,8 cm Pak 43 L/71) allowing for persistent long range accuracy, whilst you remain in cover so as not to get spotted. The camo value on this tank is good and with camouflage net/ camo crew this tank can do very well for itself. 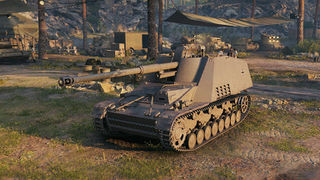 The great rate of fire, accuracy, aim time and penetration make the Nashorn an exceedingly dangerous tank and it will have no difficulty in tier 8 games with 203mm of penetration on the 8,8 cm Pak 43 L/71. The DPM is also extremely good with an average of 2284.8 which is better than the M18 Hellcat (1694.4), Achilles (1956), Churchill Gun Carrier (1765), AT-8 (2092.5), Dicker Max (1935), ARL V39 (1600.8), SU-100 (1829.1) and the SU-100Y (1650). Only the Jagdpanzer IV beats the Nashorn with 2444.2 dpm. 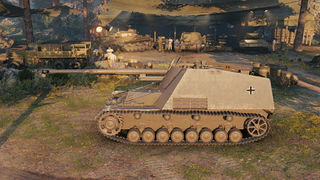 With only 360m of view range the Nashorn does struggle to spot its own targets at times, but with Binoculars this tank becomes very good at scouting out its own targets. If you researched it on the Pz.Sfl.IVc before, mount the top radio. You can mount top gun with stock tracks, but adding any equipment, including camonet or binocular telescope requires them. Next go for the top 8.8 cm gun. Note: The Nashorn shares the 8,8cm L/71 with the Jagdpanther, which eases cross-tree advancement. 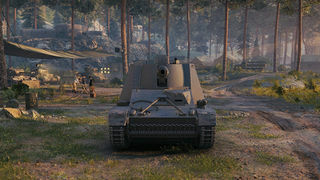 It's also available if you unlocked Ferdinand from Tiger P. Engine upgrades are shared with Hummel. After the first German experiences with the newer Soviet tanks like the T-34 or the Kliment Voroshilov tank during Operation Barbarossa, the need for a Panzerjäger capable of destroying these more heavily armoured tanks became clear. 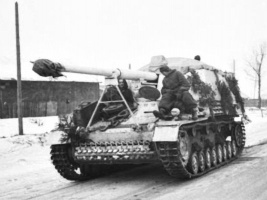 In February 1942, the Alkett (Altmärkische Kettenwerke GmbH) arms firm of Berlin designed a tank destroyer using their recently developed Geschützwagen III/IV which as its name indicated used components of both the Panzer III and Panzer IV tank. 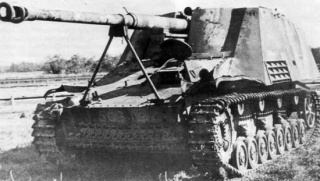 The 8,8 cm Panzerabwehrkanone 43/1 L/71 (or shortly Pak 43/1), a long-barreled anti-tank gun more known as the main armament of the Tiger II, was mounted on the rear of the chassis complete with its gun shield and an open-topped superstructure was built up around the gun to give the crew some protection. The gun had the same traverse and elevation as if it had been on its carriage: 15° to either side and between -5° to +15° elevation. To accommodate the long and heavy gun, the hull had to be lengthened and the engine moved from the rear to the centre of the chassis. The amount of armour provided for the crew compartment was limited. The shielding provided was adequate to protect the crew from blast and small arms, but not armour piercing rounds. 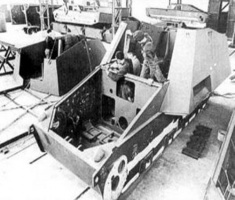 Thus like the Marder series weapons, the vehicle was not intended to engage in tank fights, but to provide mobility to an excellent anti-tank gun. During the first half of 1943, a new model of the Hornisse was introduced into production. This model altered the driver's front armour plate, along with other petty differences. This model and its predecessor, the few early production vehicles, were almost indistinguishable. 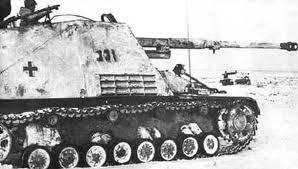 It was renamed Nashorn by Hitler in 1944. 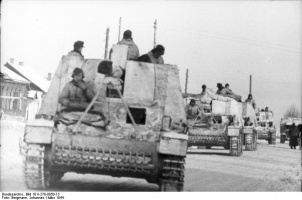 Total production of the Nashorn amounted to some 494 vehicles, most of which were built in 1943. In January 1944 Hitler favored production of a newer tank destroyer, the Jagdpanzer IV, which had a much lower silhouette, thicker frontal armor (60 mm frontal plate), and an effective though less powerful 7.5 cm gun. 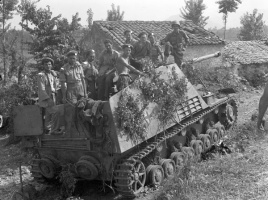 Though still primarily an ambush weapon, this vehicle was better built for armoured engagements. 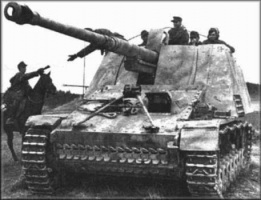 Production of the Nashorn did continue into 1945, though at a slow pace. This page was last modified on 30 November 2018, at 11:18. This page has been accessed 102,022 times.